Article 1. 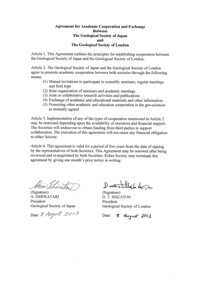 This Agreement outlines the principles for establishing cooperation between the Geological Society of Japan and the Geological Society of London. Article 2. The Geological Society of Japan and the Geological Society of London agree to promote academic cooperation between both societies through the following means. Article 3. Implementation of any of the types of cooperation mentioned in Article 2 may be restricted depending upon the availability of resources and financial support. The Societies will endeavour to obtain funding from third parties to support collaboration. The execution of this agreement will not cause any financial obligation to either Society. Article 4. This agreement is valid for a period of five years from the date of signing by the representatives of both Societies. This Agreement may be renewed after being reviewed and re-negotiated by both Societies. Either Society may terminate this agreement by giving one month’s prior notice in writing.